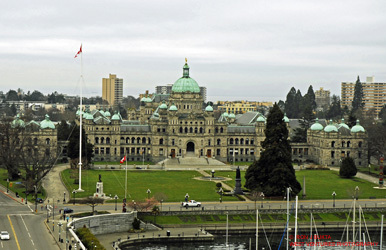 The BC Legislative Buildings dominate the architectural landscape of Victoria’s Inner Harbour. Construction of a new Parliament Building was first authorized by an act of the provincial legislature in 1893, the Parliament Buildings Construction Act. 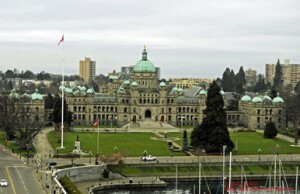 The province, anxious to show its growing economic, social and political status, was engaged in an architectural competition to build a new legislative building in Victoria, after outgrowing the previous wooden buildings, colloquially known as “The Birdcages” (built in 1859 for the Colony of Vancouver Island). Francis Mawson Rattenbury, an English immigrant, won the competition over 64 other architects, despite being only 25 at the time. Rattenbury and his crew focused the construction of the BC Parliament Buildings using, as much as possible, local materials, resources and expertise. Features include gold and silver leaf, murals, ornate plaster details and wood mouldings ornament the richly-hued walls and ceilings. Visitors also encounter solid marble columns, statuary, stained glass as well as unique architectural flourishes. The original budget was $500,000; the final cost was $923,000. Although completed in 1897, the buildings were not officially opened until February 10, 1898 to commemorate Queen Victoria’s Diamond Jubilee. Over 3,000 light bulbs were turned on in June 1897 and did not require replacement until 1976. The gilded statue atop the dome is Captain George Vancouver, the first European to circumnavigate Vancouver Island. In 1901, King George V praised British Columbia’s Legislative Buildings as one of the finest examples of architecture in the Dominion. Phase two was completed in 1915 at a cost of $1.2 million. Over $40 million was spent to restore the buildings in 1973.